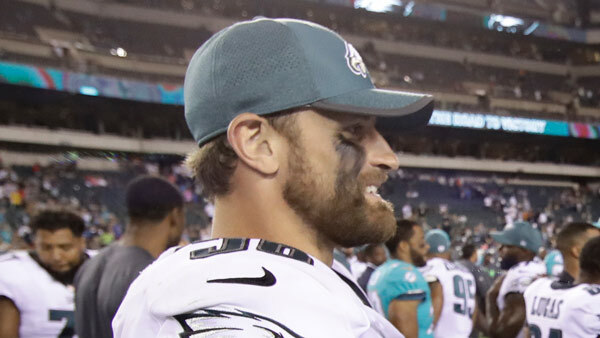 PHILADELPHIA -- Chris Long is donating the rest of his year's salary to increase educational equality. The Philadelphia Eagles' defensive end already gave up his first six game checks to provide two scholarships for students in Charlottesville, Virginia. Now, he's using the next 10 to launch the Pledge 10 for Tomorrow campaign. "My wife and I have been passionate about education being a gateway for upward mobility and equality," Long told The Associated Press. "I think we can all agree that equity in education can help affect change that we all want to see in this country." Long signed a two-year, $4.5 million contract with the Eagles, including a $500,000 signing bonus and $1.5 million guaranteed. His base salary in 2017 is $1 million. The charitable initiative encourages people to make donations to improve equal education opportunities. Long began his career in St. Louis in 2008 and played for the Super Bowl champion New England Patriots last season. Long's foundation has selected four organizations whose missions focus on making education easily accessible to underserved youth while also providing students the support they need to develop strong social and emotional character. The four organizations are based in the three communities in which Long has played during his NFL career. The city that raises the most money during the season will receive an additional $50,000 donation. "There's a lot of opportunities to help out and they're wonderful organizations," Long said. "We have such a great platform as football players and hopefully fans get behind it." Long grew up in Charlottesville and starred in high school at St. Anne's-Belfield before going to the University of Virginia. He was moved to start the scholarship program following the violent protests in Charlottesville in August. "Our hometown is a wonderful place and I feel like people got the wrong idea about what the residents of Charlottesville are all about," he said.